Measured by the value of stolen goods, Anchorage property crime has never been worse, according to new police department statistics obtained by the Daily News. Car thieves, burglars and shoplifters stole a staggering $45.3 million worth of property across the city in 2017. 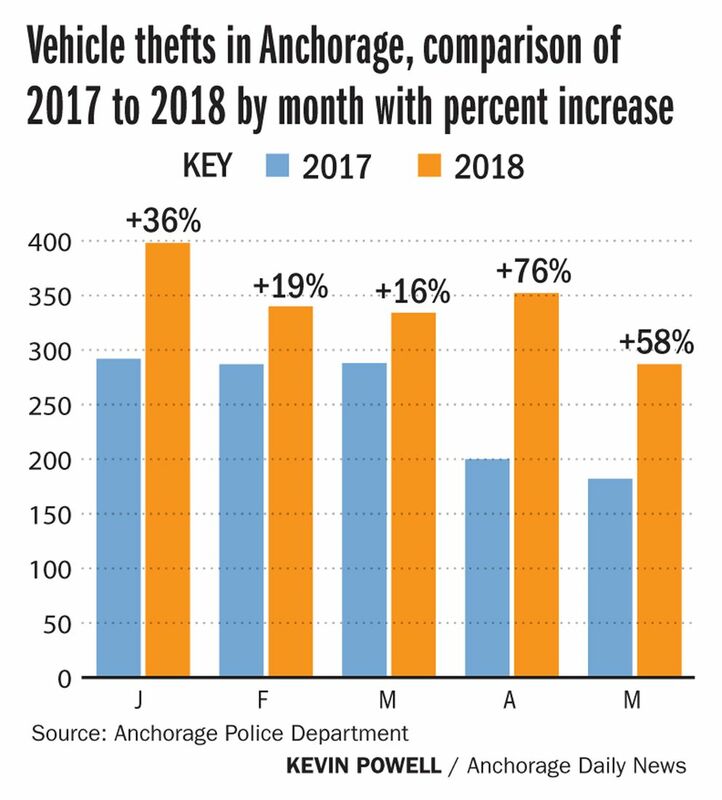 Fueled mainly by the high-dollar category of vehicle theft, that's more than twice the 10-year average for Alaska's largest city. When it comes to auto theft, 2018 is on pace to be even worse. Car thefts are up 37 percent so far this year, through May, compared to the same period in record-breaking 2017. The ongoing auto theft trend began in recent years with a ring of thieves who used vehicles in commercial burglaries and taught others how to break in and steal cars, detectives say. Now most thefts can be linked back to twin heroin and methamphetamine addictions that leave some addicts in need of hundreds of dollars a day to stave off sickness. "They don't care who they have to run through, who they have to go over," said Lt. Jared Tuia, who oversees property crime for the Anchorage Police Department. The crimes span every neighborhood and have changed the way residents feel about their city. Surveillance cameras, fresh from the box, watch countless driveways. Department stores close doors to herd would-be shoplifters to a single exit. As volunteers prune shrubs to better reveal homeless camps littered with stolen bicycles, Facebook groups cheer civilian takedowns of car thieves. For policymakers, the conversation quickly turns to drug use prevention and rehabilitation. Police say an addict who wakes up with a hit of methamphetamine might spend the next 12 hours stealing enough to feed a $120 to $300-a-day heroin habit. As a result, stolen cars and other boosted goods — from iPads plucked through shattered windows to teeth whitener pilfered from Fred Meyer — have become currency in an underworld economy among dealers and users. APD Sgt. Ty Witte said detectives have encountered suspects who know exactly how SB 91 and SB 54 — controversial efforts to reform Alaska's criminal justice system — changed sentencing for first-time car thieves. Some escalated their crimes accordingly, he said. Others gave no thought to consequences. "More than one person would describe it as, to them, it's a game of Grand Theft Auto," said Witte, a burglary and theft detective. "That's not our word. That's their word. We would hear that from witnesses talking about specific suspects," he said. "We would ask them about, 'What do you know about this person?' 'Oh, that guy is out of control. He literally thinks he is in a game of Grand Theft Auto because he is so high on meth.'" The stolen items appear for resale on Craiglist, hawked at pawnshops or traded for drugs. "It doesn't get traded necessarily for cash, in a traditional sense. It's its own form of currency," Witte said. The public's awareness of car theft, often a crime of opportunity as thieves hop in idling cars, has not reduced prevalence in recent months. In April of this year, 352 cars were reported stolen across the city, compared to 200 in April 2017. Crime has been bad in Anchorage before. Robberies and thefts previously spiked in the mid-1990s, when tens of thousands fewer people lived here. But high-quality supplies of meth and heroin have created a demand for cash that makes this epidemic different, police say. The rise of opioid use also coincided with a growing sophistication and brazenness among thieves. "If it's not bolted to the ground, it's going to be stolen," said Christopher Meador, owner of Northern Security and Surveillance. Actually, he said, correcting himself, even things that are bolted to the ground — like ATM machines — are disappearing too. "They'll just steal a tractor from the job site and use it to steal the machine," Meador said as he drove to a friend's house in Rogers Park. There, he said, he installed infrared cameras after thieves broke in and made themselves at home while the owners vacationed in Hawaii. "They took steaks out of the freezer and ran them on the grill," Meador said of the burglars. The family returned to find the house in shambles and a shaving kit full of syringes and meth. "Is anyone actually looking for them? No," Meador said. "APD can't do anything except clean up bodies." But Anchorage police say they are indeed ramping up the fight on property crime and dedicating new detectives to the cause. Since February, detectives have been helping patrol officers with car theft investigations, interviewing more than 130 suspects and leading to more prosecutions, Witte said. In the past four months, prosecutors have not dismissed a single auto-theft case that involved a detective, he said. 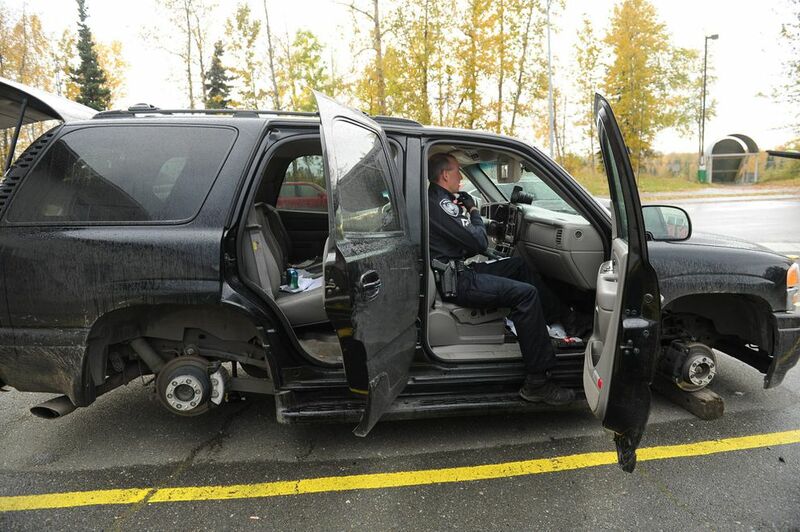 Over the coming month, the theft unit that Anchorage police once disbanded due to low staffing will be revived with three detectives who will initially focus on vehicle theft. The rise in property crime in Anchorage comes at a time when overall property crime trended downward nationwide, according to the most recent figures available. In the first six months of 2017, U.S. property crime was down 2.9 percent compared to the previous year. 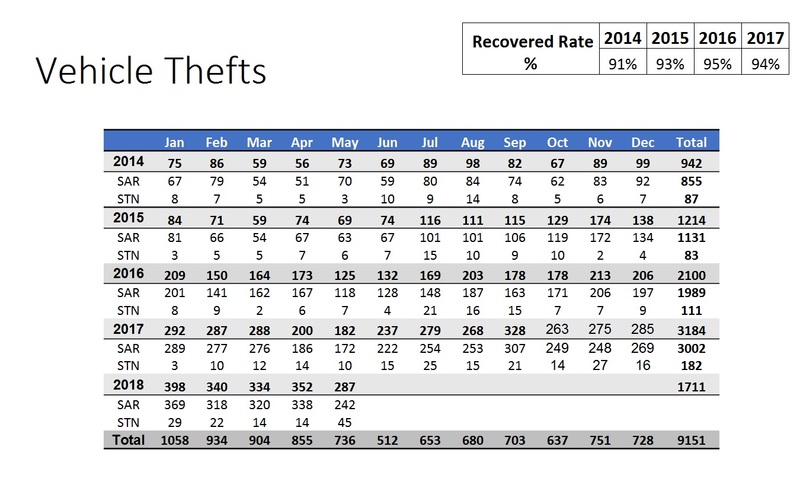 Vehicle theft rose 4 percent nationally, during that period, but in Anchorage the increase was 56 percent. In the coming days the Daily News will explore the trend with stories about those who have had their property taken, those who do the taking, and the many ways in which their lives intersect. Meanwhile, we want to hear your personal stories. If you've been touched by property crime in Anchorage in the last 18 months, email your story to khopkins@adn.com. Coming next: The aftermath of a stolen car — what owners find inside. Plus: The story of an Anchorage auto theft as told by both the victim and by the thief. NOTE: The 2017 crime statistics in this story come from Anchorage Police Department numbers expected to be published nationwide this fall in the FBI's Uniform Crime Report. See the spreadsheet of that data, provided by APD as a result of a Daily News records request. The Daily News compared 2017 data to crime numbers for each year dating back to the 1975, when Anchorage was unified into a single borough and city. Additional auto theft numbers, for 2018 to date, are from a supplemental public request by the Daily News.